This week I talked about celiac disease and gluten intolerance with Danna Korn, an expert on wheat-free, gluten-free diets and medical conditions that benefit from the diets. I interviewed Danna at a workshop held by Capers Community Markets, a chain of natural food stores in British Columbia (expanding soon to Alberta!) which carries many gluten-free products. 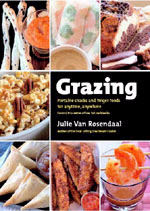 This week one of my guests was Julie Van Rosendaal, who lost 165 pounds in a year and a half by changing her diet, not going on a diet. Here are the two cookbooks she's written so far, and look for a feature on her in People magazine in March. 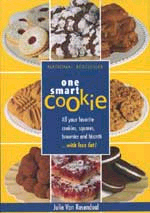 Her website is www.onesmartcookie.ca. Click here for some New Year's resolution tips from a Vancouver home-meal delivery service. What food can you NOT give up? That was the question I asked in my column this week, and if you post an answer to my blog, you could win the Lucy Waverman/James Chatto book, A Matter of Taste, published by Harper Collins at $50. Deadline is Wednesday, January 12th at 6pm Pacific Time.